One of Isla Animal’s goals is to reach out to animal owners who cannot afford to bring their pets to a vet for routine care. 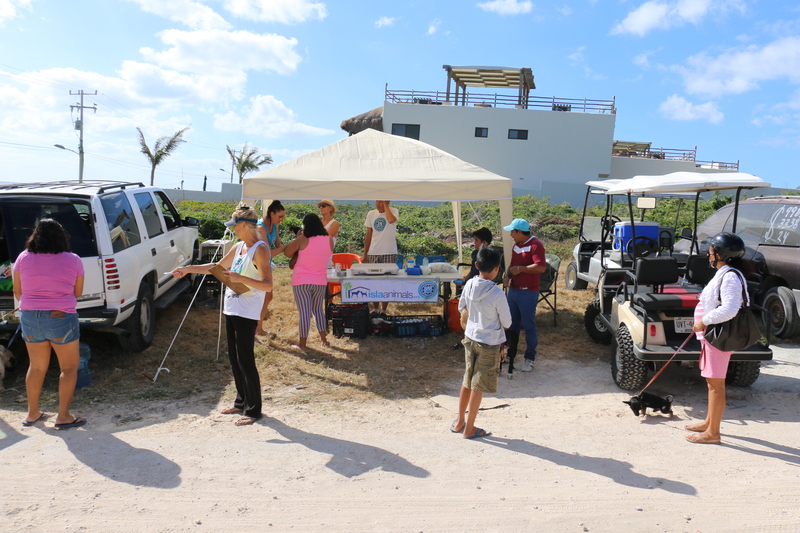 We set up in Guadalupana, an area on Isla Mujeres known as ‘the shacks’. In just 4 hours, we treated 140 dogs for fleas & ticks! It was an amazing experience to say the least. In talking with the residents of this neighborhood, we realized we must continue our work out here. Most residents cannot afford the most basic pet care, so our work is vital for the animals here. While they are loved by their owners, it takes more than just love to properly care for a pet. The residents were so grateful and appreciative! Now our goal is to do a MONTHLY FLEA & TICK TREATMENT campaign in Guadalupana Isla Mujeres. Please help us by donating funds or Frontline (largest size is best). Please consider a monthly donation, it's easy to set up and Isla Animals has a pressing need for a budget that they can depend on. To set up a monthly donation, click the button below, enter your desired donation amount and check the "Make this recurring" box on the Paypal screen. You can also make a secure one-time donation by leaving the boxed unchecked. 6th Annual Rancho Viejo Campaign 2018 – HUGE SUCCESS! Get ready for some happy tears!